It has now been 7 weeks since finding out about our precious baby girl. We had a baby shower this weekend in honor of her, given by my sister, grandmother and two of my mom’s friends, both of whom I have known for many, many years. I had a great time. It was come and go, which allowed more time for conversations with friends and family. I had a fantastic time catching up with old friends and talking to lots of people about our daughter. We received so many nice presents, which made me even more excited to have her in my arms. I don’t think we have announced her name on our blog yet, but her name is Sophia. Once we pass court, we will let everyone know her Ethiopian name, which will be her middle name. I call her by her Ethiopian name, more than I call her Sophia. I am slowly getting more comfortable with calling her Sophia or Sophie. At first, I felt like I was betraying her if I didn’t call her M. I think we will probably call her by both names, not necessarily together, but I think both belong to her equally. My sister ordered an Africa shaped cookie cutter and made these cookies. They were great and tied in very well with the theme of the shower. 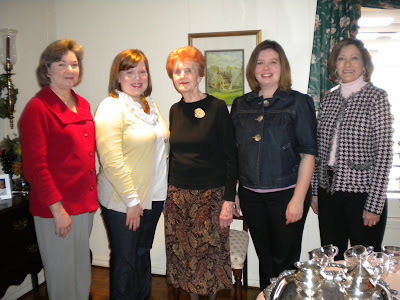 The hostesses: Marileigh (my mom's best friend since 4th grade), Amy (my sister), my grandmother, me, and Connie (she and my mom worked together for a very long time). We have been busy getting Sophie's room ready. It is starting to look really cute. The crib is up and Michael is putting the dresser together as I type this. I will probably wait to post pictures until the room is finished. I am a final product kind of girl. It has to look perfect! so much fun! I can't wait to get our court dates and go get our girls!! 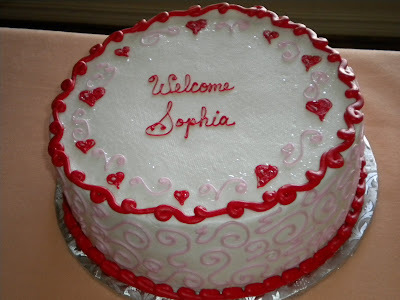 I LOVE the name Sophia/Sophie! We know a little girl adopted from Ethiopia with that name and if she wasn't our neighbor that would have been our number one choice if the boys had been girls. So glad you had a nice shower and that the room is coming along (so fun, isn't it???). Seven weeks, you are right there! And I am right behind you!!! COME ONE COURT DATES!!!! Love the cake & cookies!Her name is precious! I love it!! Praying for a court date SOON, she needs all her shower goodies!! It looks like such a great time! I also love the name Sophia!!! 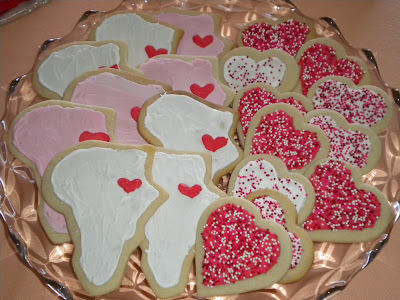 Do you know where your sister bought that Africa shaped cookie cutter? I would love to get one too. SO cute!! Hoping you get news of a court date soon!! Thanks, Emily B.
I love the name!!! In fact we are trying to decide between two names for our little girl and the one we are leaning towards is a variation on Sophia :) I really loved Sophia, but Travis was convinced that people would call her sofa. What a funny guy! I am hoping that you are on the phone with Kristin getting your court date right now as I type this...and if not, come on phone, RING! Oh I can't wait to see the room! Those cookies look like they belong in a food network magazine. Very classy. 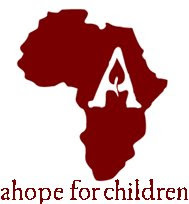 Yes, you have the correct website of the orphange in Gondar. We have a ton of pictures from the orphanage and would be happy to share more with you. Will you be able to travel to Gondar when you go to Ethiopia? Katie, I agree completely! 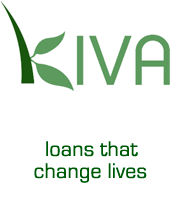 We have been blown away with the support from people we never expected to get involved. I also can't believe how long two months feels :) Yet, it's gone by fast...all of sudden we've been waiting TWO MONTHS...ARGH. Hopefully this is our lucky week! I am 33 years old and married to my wonderful husband, Michael. We have been married for nine years. In April 2010 we adopted our beautiful daughter, Sophia, from Ethiopia. Thank you for joining us! Aging comes with a Crown! Monday Morning Mix - Christmas Songs!